Steel-cut oats, sometimes called Irish oats or Scottish oats, are made by running whole oat groats through a steel mill to chop them into pieces. This variety of oats imparts a slightly nuttier taste than regular oats, and it has a chewy texture. You can use steel-cut oats as a cereal, such as in oatmeal, or add them to baked goods for a heavy, nutritious product. A 1/4-cup serving of uncooked steel cut oats has 150 to 170 calories. Cooking these oats does not change the calorie content. 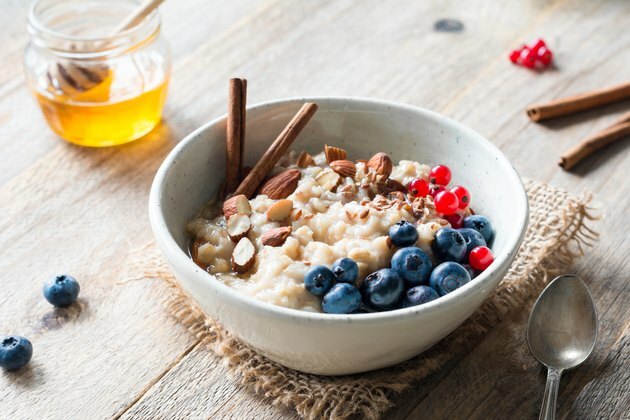 If you use steel-cut oats, it's common to add flavorings, including maple syrup, fruit or brown sugar. Be sure to include the calories from these flavorings in your meal plan. Columbia University recommends eating a breakfast containing 350 to 500 calories to best meet your energy needs in the morning. Consider eating oatmeal made from steel-cut oats with a side of fruit, a glass of fruit juice or a lean breakfast meat to bring your meal into the ideal calorie range. A portion of steel-cut oats contains 3 g fat. Limit fat consumption to no more than 20 to 35 percent of your daily calories, or 44 to 78 g fat on a 200-calorie diet. Including steel-cut oats in your meal plan gives you a big boost of complex carbohydrates, a macronutrient that serves as your main source of energy. Each 1/4-cup serving contains 27 to 29 g carbs, or 21 to 22 percent of the 130 g recommended for daily consumption by the Institute of Medicine. Fiber, a kind of carbohydrate that does not break down into fuel for your body, is also found in steel-cut oats. One serving provides 4 to 5 g — your meal plan should include 25 to 38 g fiber. Add fiber to your diet slowly. Consuming too much fiber before your body has the opportunity to adjust to it can result in bloating and gas. Steel-cut oats serve as a good supply of protein, offering 5 to 7 g per 1/4-cup serving. Your body uses protein as a secondary source of energy, but it has a more important role. Protein is present in nearly every cell, tissue and organ in your body, and eating adequate levels allows you to replace proteins as needed easily. It also features heavily in helping you to build muscle. The protein in steel-cut oats is considered an incomplete protein because it lacks all nine essential amino acids. You can get all the amino acids you require by serving steel-cut oats with legumes, such as peanuts. One serving of steel cut oats provides 10 percent of the iron you need each day. Iron helps your body get the oxygen it needs to function properly. Without enough of this mineral, you may develop anemia. Symptoms of anemia include dizziness, heart palpitations, headaches and fatigue. You will also get 2 percent of the daily recommended value of calcium from each 1/4-cup serving of steel-cut oats. The strength of your bones and teeth depends on getting adequate levels of calcium, as your body does not manufacture this nutrient on its own, and every little bit helps. Steel-cut oats require more time to cook than regular oats. Cooking time can be lowered to five minutes if you soak oats overnight; however, if you start with unsoaked steel-cut oats, it will take 35 minutes to cook them thoroughly. Making oatmeal using these oats — the most common use — requires you boil oats in water and then simmer until they're chewy yet tender. Add 1 cup milk and cook an additional eight to 10 minutes until all the liquid is absorbed. What Is the Nutritional Value of Oatmeal?